RBL Bank is a private sector bank which is fast growing in India. It has over 235 branches and around 375 ATM counters across India. It has its presence in 16 states and union territories in India. The bank is well known as 'Global Growth Company' in the World Economic Forum. It has received several awards by Business Today from 2012 to 2016 as India's Best Bank in Growth segment of small scale banking. The bank offers many types of credit cards to their customers. If you have applied to RBL for its credit card and want to check RBL bank credit card application status online then this article is for you. RBL Bank offers many types of credit cards and based on your requirement and eligibility you can apply any one the credit cards offered by this bank. Some of the credit cards offered by this bank are - Insignia Preferred Banking World Card, Platinum Delight Card, Platinum Maxima Card, Classic Shopper Cards, Classic Platinum Card, Movies and More Card, RBL Bank Icon Card, India Startup World Credit Card, Platinum Edge SuperCard, Platinum Max SuperCard, World Prime SuperCard, HyperCITY Rewards Credit Card, Crossword Black Credit Card, Blockbuster Credit Card, IGU NHS Golf World Card, Classic Reward Cards, Titanium Delight Card, Crownit Card, MoneyTap Card, India Startup Club Platinum Credit Card, RBL Bank Fun+ Credit Card, Platinum Prime SuperCard, Platinum Classic SuperCard, World Max SuperCard, HyperCITY Rewards Plus Credit Card and Crossword Rewards Credit Card. Step 2: You will find a RBL Bank logo at the top right hand side of the website. Before that logo you will find three horizontal parallel lines. Place your mouse on that and do a single right click. Step 3: It will open up a new page with a heading of 'Our Products'. Step 4: Go to Personal then Credit Cards and click on 'Credit Cards'. Step 5: This will open up a new page with all the credit cards details. You will find all the credit cards offered by RBL Bank here. Step 6: Scroll down and go to the bottom of this page. You will find text stating 'To know your Application Status, Click here'. 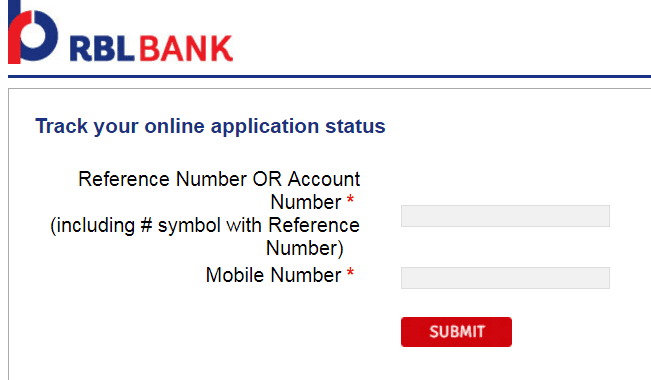 Step 9: Click 'Proceed' tab or use direct link https://rblbank.rupeepower.com/application-status. It will open up a new page where you can track your credit card online application status. Step 10: Enter Account Number or Reference Number in the first empty box. Remember to include '#' symbol while entering Reference Number. Step 11: Enter your mobile number that you have entered at the time of applying for the credit card online and then click 'Submit' tab. Step 12: You will get the details of your credit card application status on the next page. Hope this article has solved your query on RBL bank credit card application status enquiry online. Hi, sir my Rbl credit card application no #CCOD23A09X I am unable to track my application. Now, will you please tell me the status for same please mail me the current status details. Hi sir, My RBL credit card application number is 1712517875. I am unable to track my application number. Will please tell me the status for the same. MY APPLICATION NUMBER 117782 PLS SEND MY STATUS. My application #CCP7CIH36S so please send us the application status or send me through the mail I'd as I providing u. How can I check my rbl super credit card application status? How to check rbl credit card application status by mobile number. I am Hitesh Vasant Loke, have applied for RBL platinum Delight Credit card and I would like to know the application status of the same. How can I check my credit card status without application I'd? May I know my application I'd by mobile number? How to track credit card application status rbl bank. I want to rbl credit card status by mobile number..
How to Launch your Startup Venture without Spending a Dime?